Nicollet, MN - Through the combined efforts of parents, law enforcement agencies, educators, community leaders, and the private sector, our country has made significant progress in the fight against underage drinking and drunk driving. But there's more work to be done. 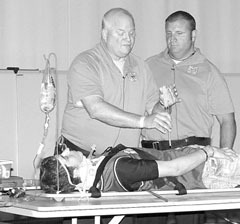 Firefighters/paramedics Patrick Kelly and Greg McCarty walked NHS students through situations that might lead to poor decisions, then to what happens at a trauma scene using the medical equipment they use in their jobs. Their "victim" was NHS senior Garrett Miller. That was the message brought to Nicollet High School last week. Featuring photos and descriptions of real life trauma incidents, paramedics/firefighters Greg McCarty and Patrick Kelly brought the Street Smart program to Nicollet as part of the Stay Alive From Education (S.A.F.E.) program. The paramedics underscored the importance of making responsible decisions and compelled the audience to participate. They didn't lecture ? they didn't have to. Instead, they presented a real life, no holds barred graphic view of everyday situations they face. And they involved the students in their presentation. McCarty and Kelly noted that firefighters now respond to more medical and trauma calls than fire calls?and that the sudden, violent trauma calls are the type that affect the students' age group. Motor vehicle accidents are the leading cause of death in the 12 to 24 year-old age group. Drugs, alcohol, and not wearing seat belts are the things most likely to cause those accidents. With that said, the two presented a four-minute graphic video showing the results of making poor choices dealing with drugs and alcohol, and not wearing seat belts. Everyone pictured in the video died in horrendous circumstances. Turning their attention to seatbelts, the two asked the students if they ever went anywhere in a car without wearing a seatbelt. When many admitted to not always being belted, McCarty and Kelly asked the students why, then debunked the excuses. Unbelted drivers/passengers are often ejected in crashes and are 25 times more likely to die than those who are belted. The paramedics noted that unbelted back seat riders can become deadly weapons to those seated ahead of them, and even cause their death. While airbags may save lives, they are a supplemental restraint system and only deploy once. Seatbelts can help in secondary collisions that follow the first impact. While fear of fire may be an excuse to not wear belts, Kelly noted that flames from a crash are usually put out before they reach the passenger compartment. And, whether it's fear of fire or being trapped in water, McCarty noted, "You have to survive the crash to get out of the car?you have to be conscious. A seat belt helps with that." The two also told students to think about what's in the back of their cars?a bowling ball or even a 20-pound backpack?that can become a projectile and even cause death in an accident that probably wouldn't be serious otherwise. "Take the time to put those things in the trunk," they said. McCarty and Kelly then picked a "volunteer" from the audience to help with their presentation?senior Garrett Miller. They walked Miller through a situation teens could find themselves in?a big party, planning not to drink, but getting talked into it, driving, and not wearing a seat belt because judgment is impaired. Add in checking a text message and disaster is waiting to happen. For their example, the two showed a picture of a dump truck. "You hit the back of the dump truck. Your face hits the windshield. Your friends find you. They shouldn't try to move you?they should call 9-1-1," Kelly said. When they're called, the firefighters/paramedics might face one of three possibilities. "If there's no pulse, it's an easy call?but the hard part is that knock on your prents' door, the one they've been dreading since you were born," McCarty said. "A second option is that there's a pulse, you're breathing, and unconscious. The third option?the one we almost always find?is that you're screaming." With Miller as their victim, the paramedics walked the audience through what happens at a trauma scene, using the medical equipment they employ daily in their jobs. The first step was to put a collar on Miller, to prevent any further spinal cord damage, and to simulate cutting his hair so it wouldn't interfere with the collar. They check the airway and breathing, and cut the victim's clothes to get vitals. If necessary, the car is cut apart to get the victim out, then he's carefully put on a backboard. Once on the backboard, the rest of the victim's clothes are cut off to check for injuries and his head, feet, and legs are taped down to prevent movement/injury. Vitals are checked again and IV fluids may be administered. "Hands and arms are not usually good options so we use the external jugular veins in the neck. If that's not an option, there's a flat spot below the knee where we go into the bone marrow," McCarty said. And, if there's a collapsed lung, the pressure has to be released in the chest?using a four-inch needle...on both sides. A hole may have to be cut in the throat. And all this without the benefit of pain killers. All because of poor choices. Victims are usually air-lifted to a trauma cen¬ter?where things really get scary, according to the paramedics. No pain meds are ad¬ministerd at they could cause blood pressure to drop. A chest tube is put in the side, a catheter in¬stalled, the neurosurgeon checks for spinal dam¬age, blood may be ad-ministered hour after hour. "You can be on a backboard six to 12 hours while all the scans are being done. It will be painful as you heal. Even with plastic surgery, your face won't look the same after hitting the wind¬shield," McCarty said. "And there's one in-jury?the spinal cored? that doesn't heal. With that, you get once chance, and one chance only. You won't walk, play sports, dance. You'll have to rely on your fam¬ily and friends for every¬thing," he told victim Miller. "Over 50 percent of all spinal cord injuries come from auto accidents." Turning to the audience of seventh to 12th grade students, Kelly asked, "How many of you know somebody who died of traumatic injuries?" After seeing some hands, he told them, "Another five to eight of you will know somebody in another year. One in 100 people will die of traumatic injuries. Look around. Who will that be?" McCarty added, "What can you do to stack the odds? Wear your seatbelt. Don't drink and drive. Common sense says don't do it and don't get in a car with someone who did. Common sense says wear a seat belt. Every 12 minutes somebody dies in an accident." He added, "You can take this information and use it, share it with your family, and live a long and healthy life. Please be safe out there." Stay Alive From Education (S.A.F.E.) is a non-profit organization created by firefighter/paramedics in Florida and is dedicated to reducing injuries and fatalities. Since 1989, S.A.F.E. has reached high school and college students and military personnel around the world. It has reached over 100,000 people a year each of the last five years, with over 175,000 last year. Kelly and McCarty spend at least a week a month making presentations. Kelly is a full time firefighter/paramedic with the Orlando, Florida fire department. McCarty is retired from the Tampa department. The ongoing educational program is supported by Anheuser-Busch Companies, Inc., bases, and community organizations. S.A.F.E. made eight presentations in Minnesota over a three-day period last week. Amy Kirby, corporate social responsibility coordinator for Tow Distributing in Mankato, noted that the wholesaler wants to spread a responsible message to the entire area. "We distribute the product. We want it to be used responsibly by the right people," she said. "We had a great reaction from students, parents, and faculty to last year's program. We felt the impact was good enough to warrant a return program."